We cultivate a large variety microalgaes and copepods. AlgaGen is a marine biotechnology company specializing in microalgae. Our vision is to produce high-value by-products from microalgae and other marine organisms that benefit human and animal health. 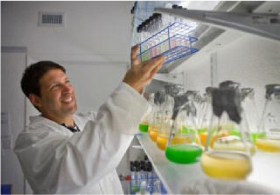 Over the past 16 years we have become a leader in the production of microalgae and have provided algal cultures as inoculum from test tube through large volume bulk to numerous, prestigious clients. Our algae is used by the professionals in the biofuels, nutraceutical, cosmaceutical, biomedical, oceanographic, aquarium, and aquaculture industries. AlgaGen is an active company with a production infrastructure that enables production on numerous levels of scale. Demand for our products ensures that we harvest and process microalgae 7 days a week. Our algae are grown under the most careful conditions in a region that is responsible for some of the finest citrus in the world. Whether it is the Florida sun, the tropical air, the quality of our ocean water and/or our freshwater aquifer (once thought by Ponce de Leon to extend life), we are not 100% sure, but the algae and other marine organisms we culture, grow very well and exhibit extraordinarily healthful properties. We wear numerous, different hats throughout the course of a day. We are very proud of the individuals that work at AlgaGen. The experience set that makes up AlgaGen encompasses diversity and depth. Our team draws from a marine microbial ecology, chemical engineering, chromatography, sales, hatchery, chemistry, aquaculture and retail professions. We average 25 years of experience per individual.